Sovereign Order of Malta 1998 Coronation of the Virgin and Saints unmounted mint. 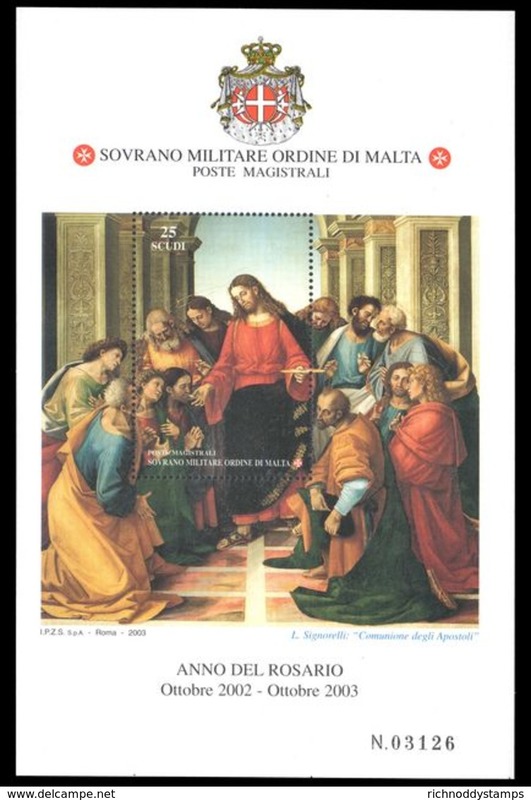 Sovereign Order of Malta 2008 Adoration of the Shepherd souvenir sheet unmounted mint. 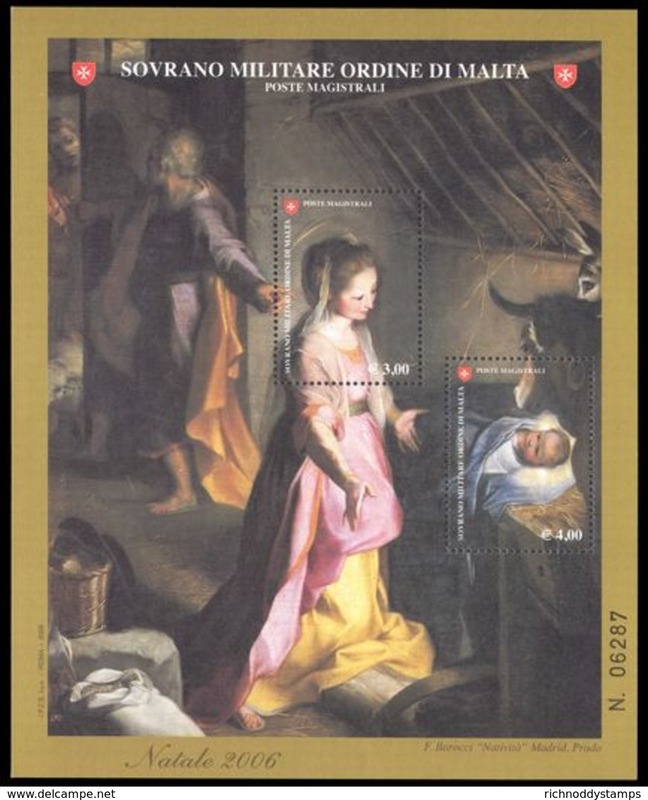 Sovereign Order of Malta 2007 Adoration of the baby Jesus souvenir sheet unmounted mint. 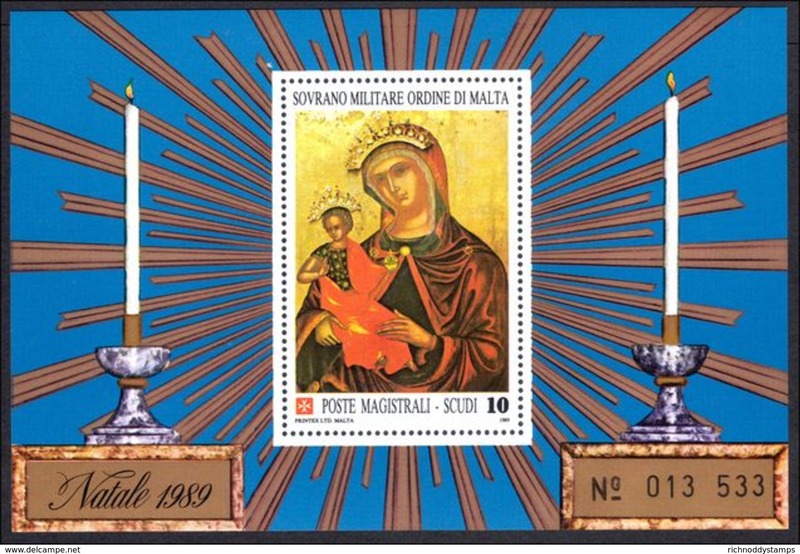 Sovereign Order of Malta 2007 Madonna and the baby Jesus souvenir sheet unmounted mint. 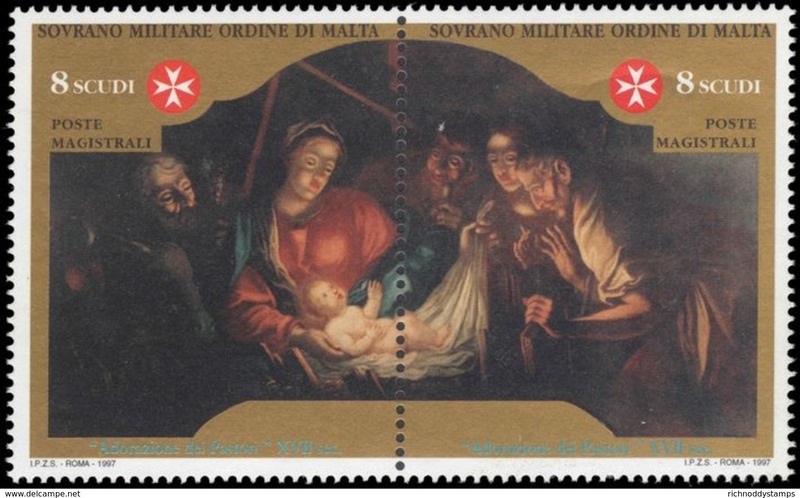 Sovereign Order of Malta 2006 Nativity by Frederico Barocci souvenir sheet unmounted mint. 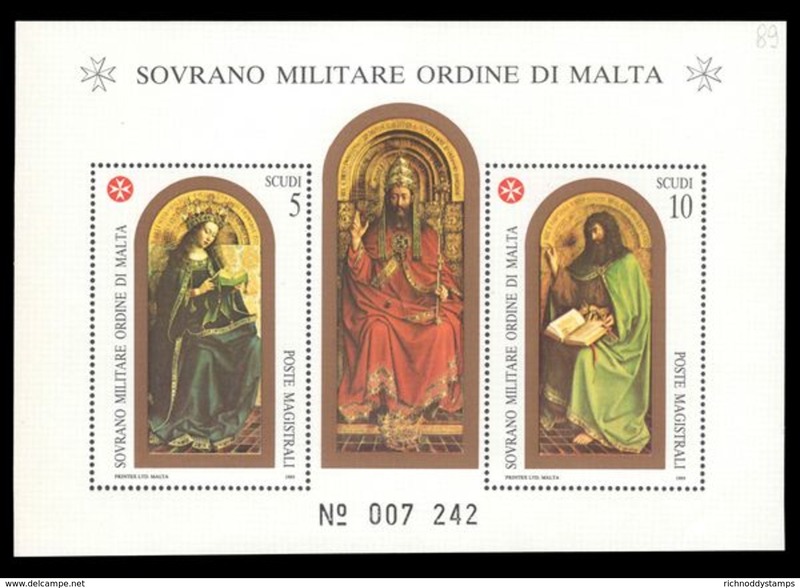 Sovereign Order of Malta 2006 Batism of Christ souvenir sheet unmounted mint. 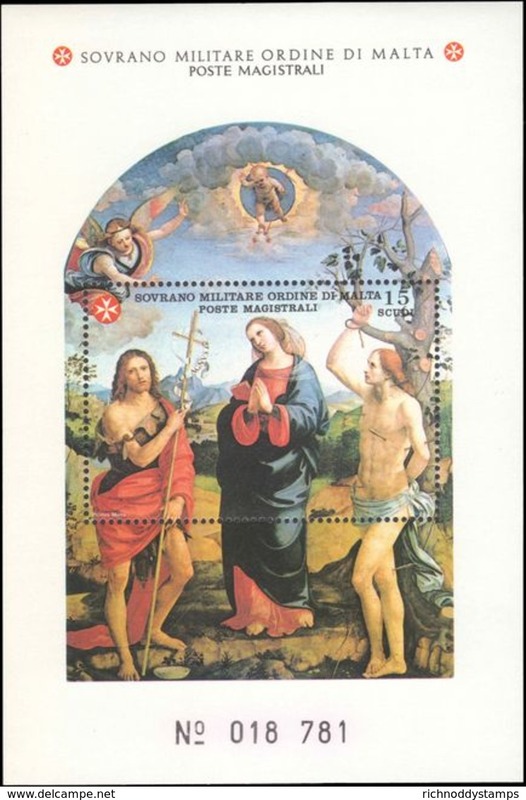 Sovereign Order of Malta 2003 Communion of the Apostles souvenir sheet unmounted mint. 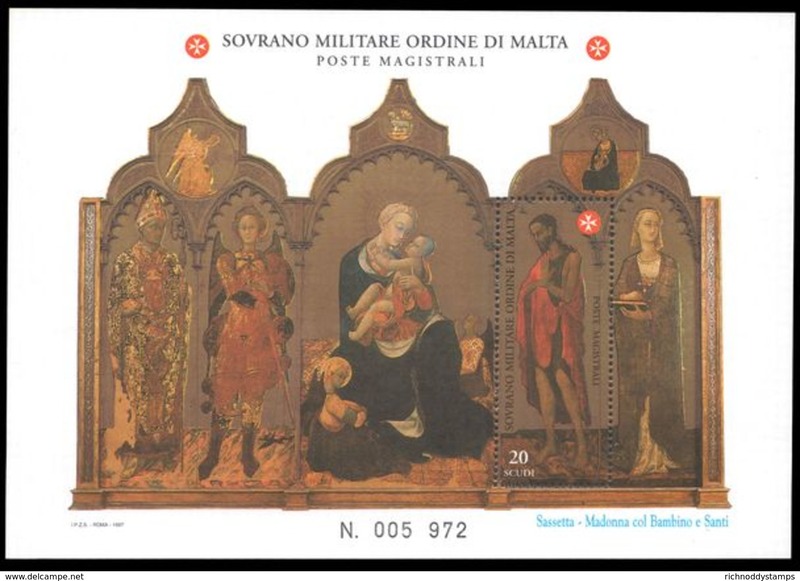 Sovereign Order of Malta 2000 Art donations to the Order unmounted mint. Sovereign Order of Malta 2000 Ancient Military Orders unmounted mint. 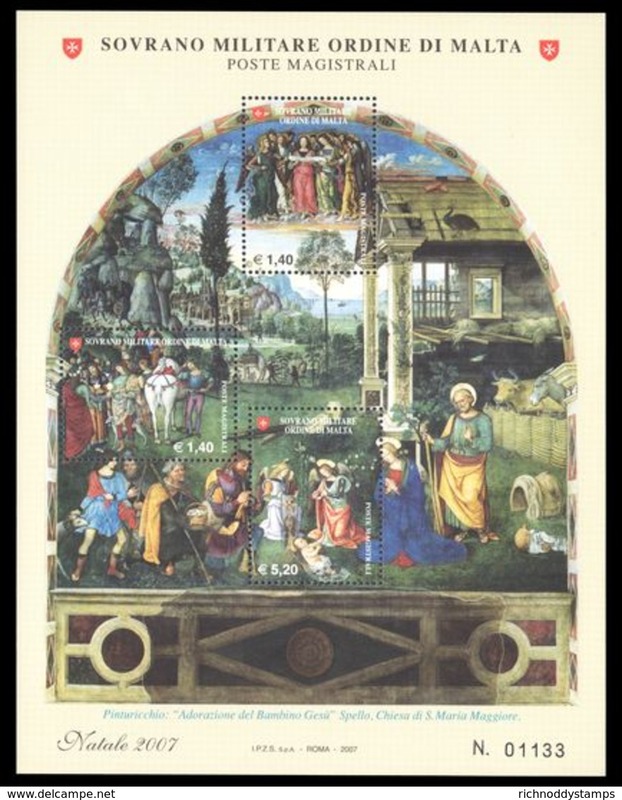 Sovereign Order of Malta 2000 Adoration of the Shepherd souvenir sheet unmounted mint. 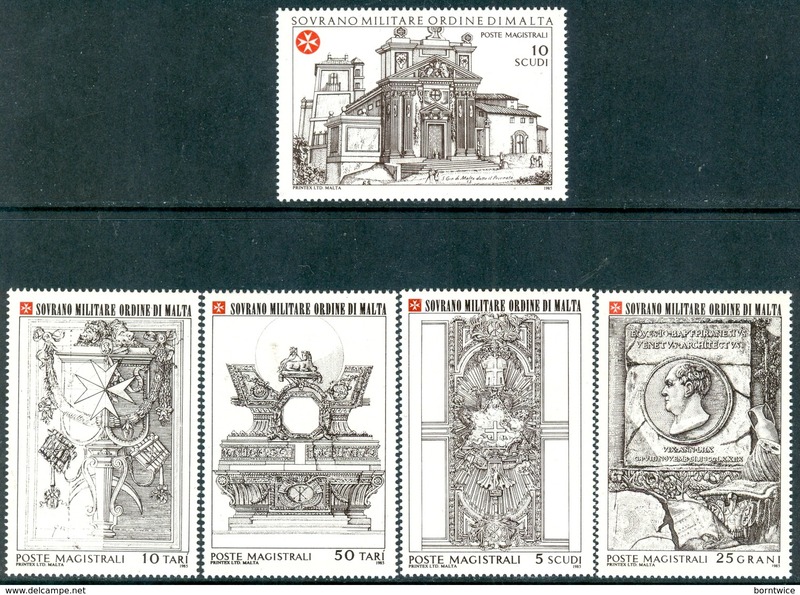 Sovereign Order of Malta 1999 Balkan relief fund unmounted mint. Sovereign Order of Malta 1999 St Hugo souvenir sheet unmounted mint. Sovereign Order of Malta 1998 Adoration of the Shepherd unmounted mint. Sovereign Order of Malta 1998 Father Andrew Bertie unmounted mint. 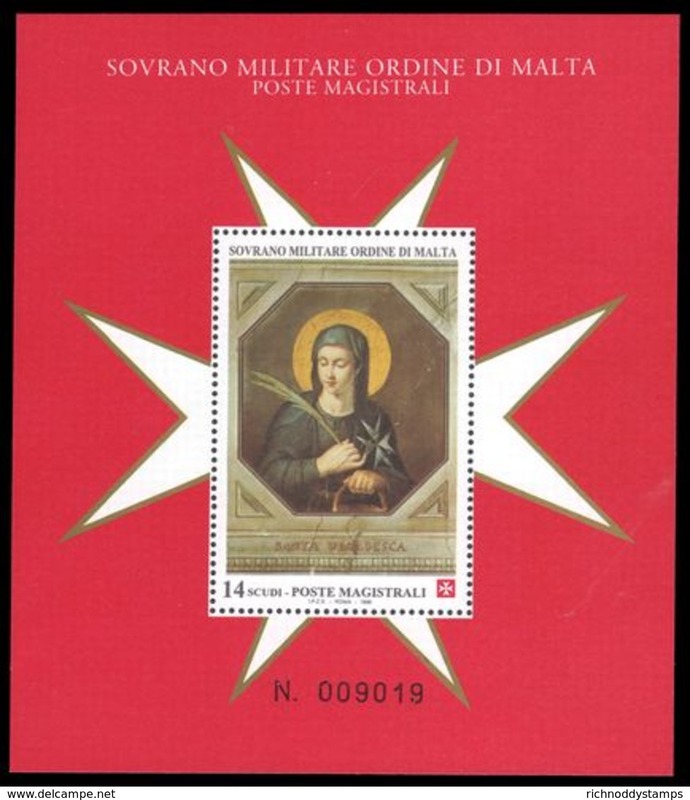 Sovereign Military Order of Malta 2007 Santa Flora souvenir sheet unmounted mint. 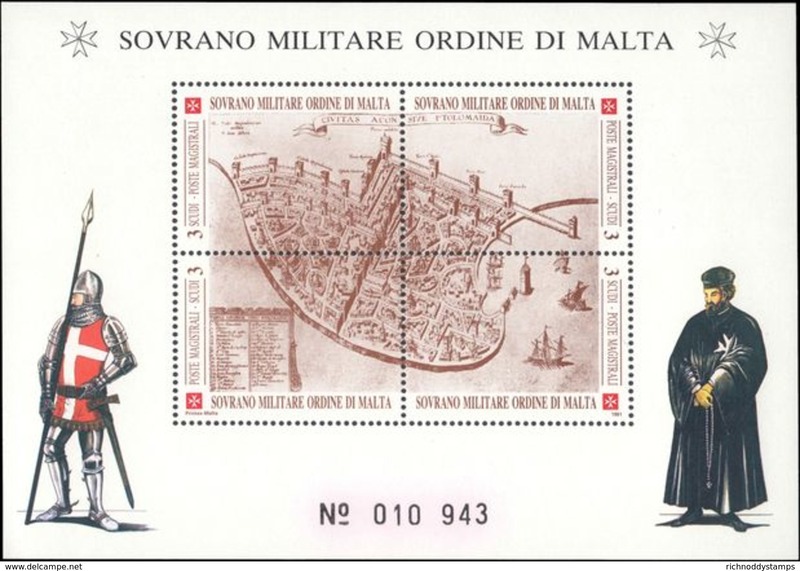 Sovereign Military Order of Malta 2002 The Annointing souvenir sheet unmounted mint. Sovereign Military Order of Malta 1997 Adoration of the Magi unmounted mint. Sovereign Military Order of Malta 1997 On the Way to the Crucifiction unmounted mint. 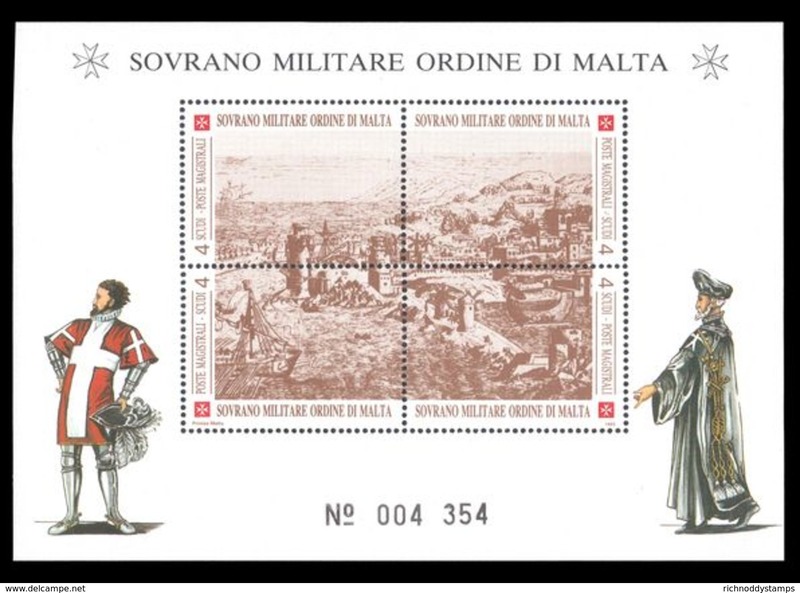 Sovereign Military Order of Malta 1997 San Giovanni painting souvneir sheet unmounted mint. Sovereign Military Order of Malta 1997 Detail from Madonna and Child unmounted mint. Sovereign Military Order of Malta 1997 Death of St Margaret of Cortona unmounted mint. Sovereign Military Order of Malta 1997 Hospitals unmounted mint. Sovereign Military Order of Malta 1997 Grand Master Father Raymond Perellos y Roccaful unmounted mint. Sovereign Military Order of Malta 1996 Coats of Arms of the Priories unmounted mint. Sovereign Military Order of Malta 1996 Masters of Painting Caravaggio unmounted mint. 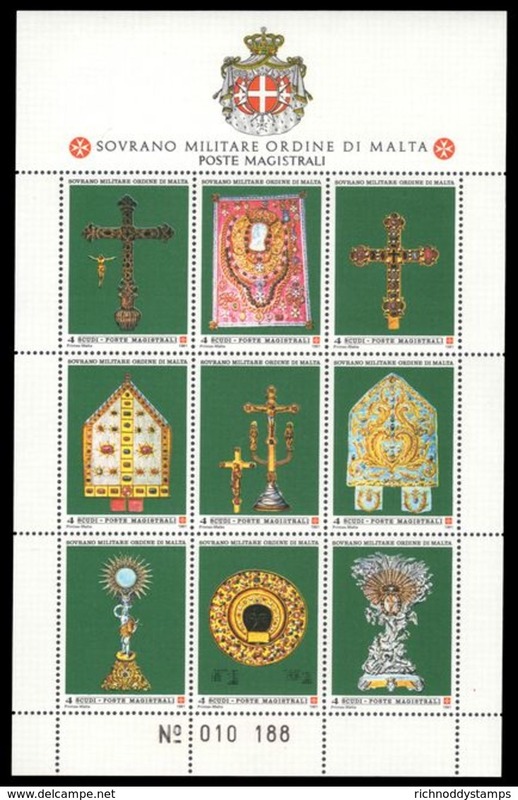 Sovereign Military Order of Malta 1996 San Giovannio painting souvenir sheet unmounted mint. Sovereign Military Order of Malta 1996 San Giovannio painting unmounted mint. Sovereign Military Order of Malta 1996 Hospitals and Castles of the Order unmounted mint. Sovereign Military Order of Malta 1996 St Ubalsesca Taccini souvenir sheet unmounted mint. Sovereign Military Order of Malta 1996 Disaster Relief unmounted mint. Sovereign Military Order of Malta 1995 Solemnity of The Order unmounted mint. Sovereign Military Order of Malta 1995 Centenary of Radio unmounted mint. Sovereign Military Order of Malta 1995 St Giovanni by Ferretti unmounted mint. Sovereign Military Order of Malta 1995 United Nations unmounted mint. 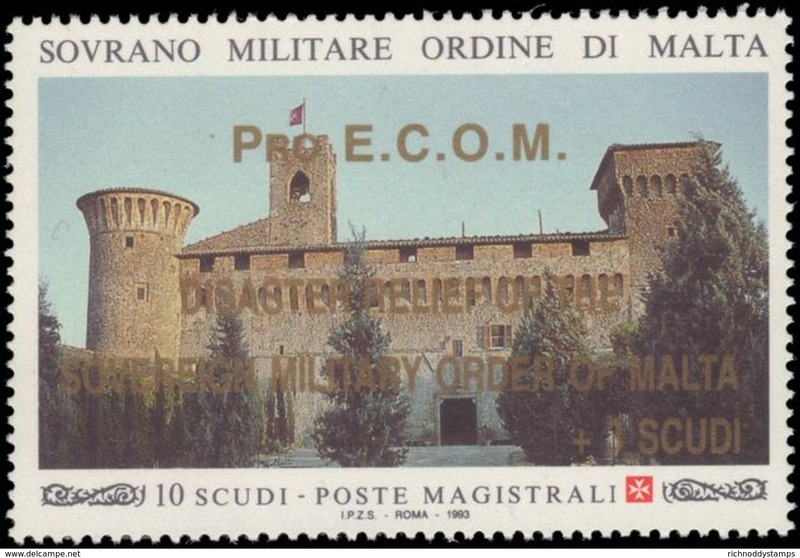 Sovereign Military Order of Malta 1995 Sanctuary of Holy House of Loreto unmounted mint. 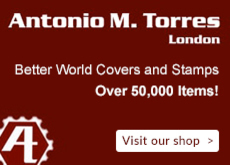 Sovereign Military Order of Malta 1995 800th Birth Centenary of St Antonio unmounted mint. Sovereign Military Order of Malta 1994 Hugo van der Goes unmounted mint. Sovereign Military Order of Malta 1994 Humaitarian help for Ruanda unmounted mint. Sovereign Military Order of Malta 1994 Coats of Arms of the Priories unmounted mint. 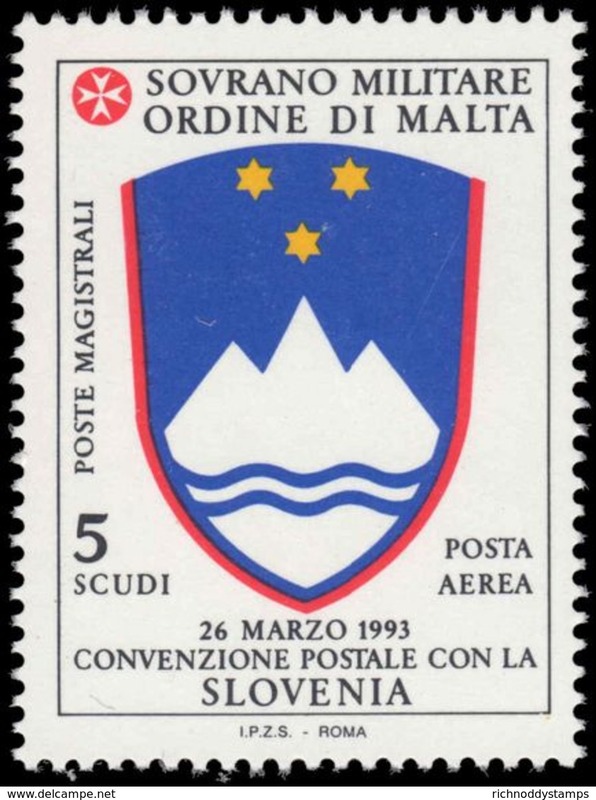 Sovereign Military Order of Malta 1994 Postal Convention with Slovenia unmounted mint. 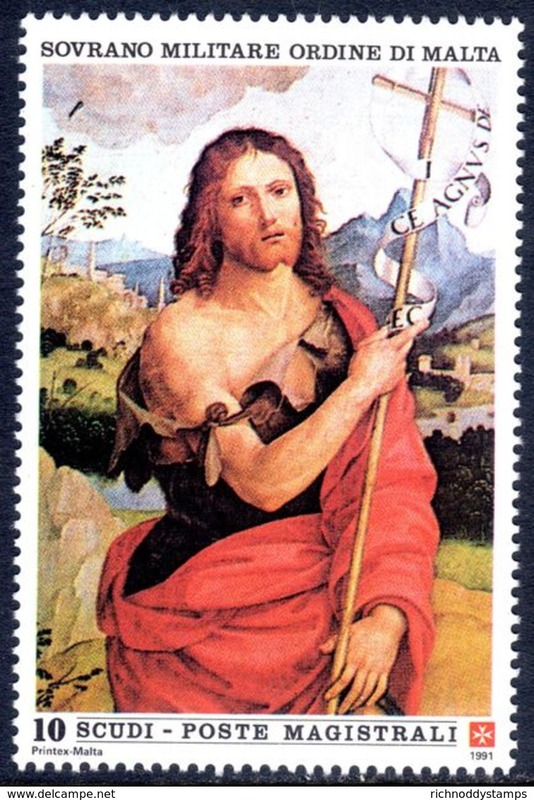 Sovereign Military Order of Malta 1994 St John the Baptist by Francesco del Cossa souvenir sheet unmounted mint. 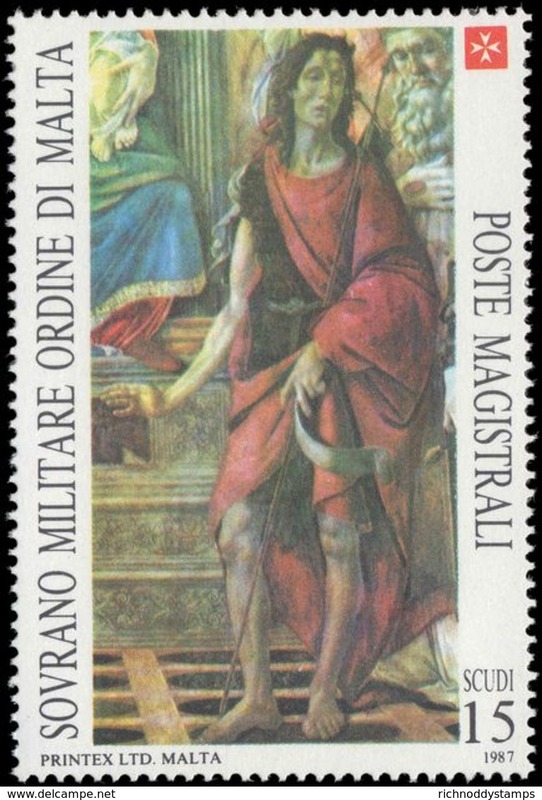 Sovereign Military Order of Malta 1994 St John the Baptist by Francesco del Cossa unmounted mint. Sovereign Military Order of Malta 1994 Residences of The Order unmounted mint. Sovereign Military Order of Malta 1994 Grand Master Jean de la Vallette-Parisot unmounted mint. 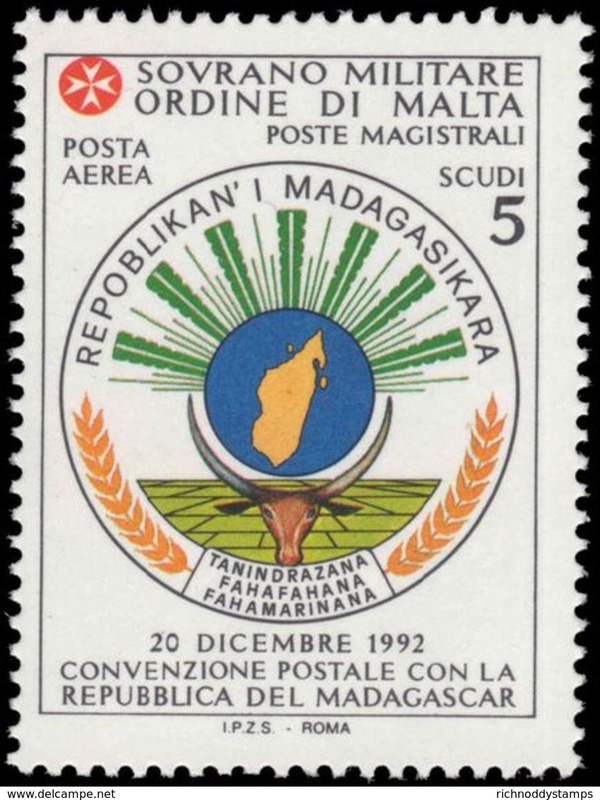 Sovereign Military Order of Malta 1994 Postal Convention with Madagascar unmounted mint. Sovereign Military Order of Malta 1994 Masters of Painting Caravaggio unmounted mint. Sovereign Military Order of Malta 1993 Christmas. 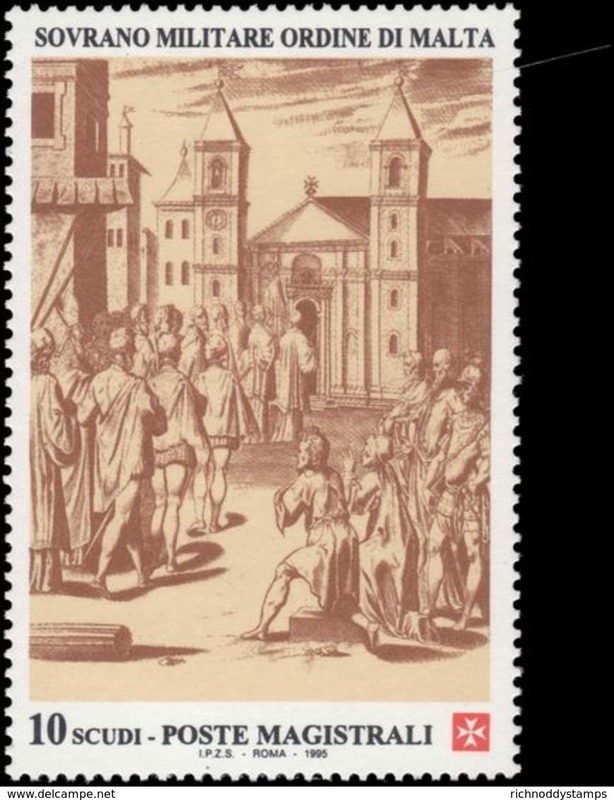 Madonna by Giotto souvenir sheet unmounted mint. Sovereign Military Order of Malta 1993 Ancient Uniforms of The Order unmounted mint. Sovereign Military Order of Malta 1993 Strategic Meeting of The Order unmounted mint. Sovereign Military Order of Malta 1993 Fort on Rhodes souvenir sheet unmounted mint. Sovereign Military Order of Malta 1993 Solomnity of The Order unmounted mint. Sovereign Military Order of Malta 1993 Residences of the Order unmounted mint. Sovereign Military Order of Malta 1993 Masters of Painting Caravaggio unmounted mint. Sovereign Military Order of Malta 1992 International Nutition Congress unmounted mint. Sovereign Military Order of Malta 1992 500th Anniversary of Discovery of America unmounted mint. 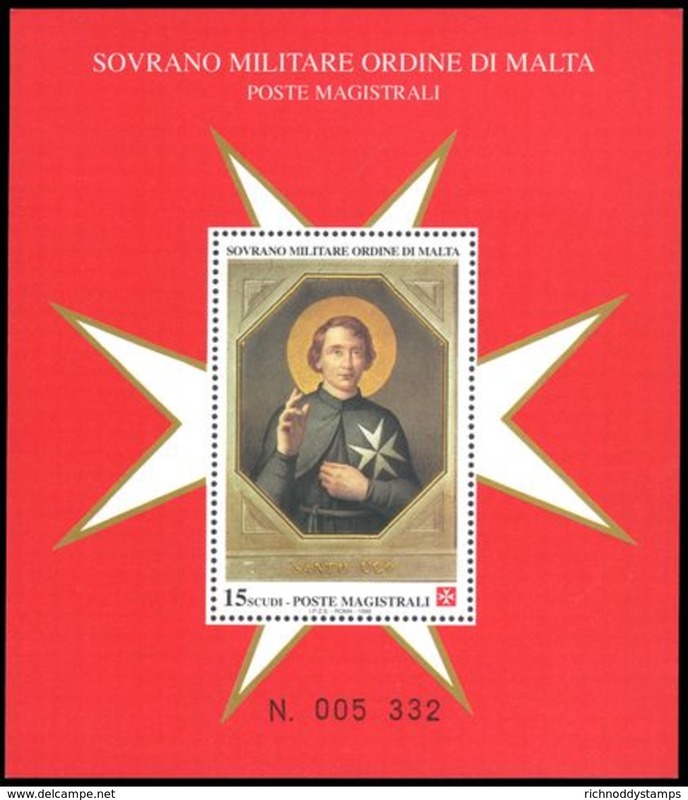 Sovereign Military Order of Malta 1992 Postal Convention with Chad unmounted mint. Sovereign Military Order of Malta 1992 Medals against the poisons of Francesco Buonarroti unmounted mint. Sovereign Military Order of Malta 1992 Masters of Painting Strozzi unmounted mint. Sovereign Military Order of Malta 1991 Relics of The Order souvenir sheet unmounted mint. Sovereign Military Order of Malta 1991 Postal Convention with Central African Republic unmounted mint. 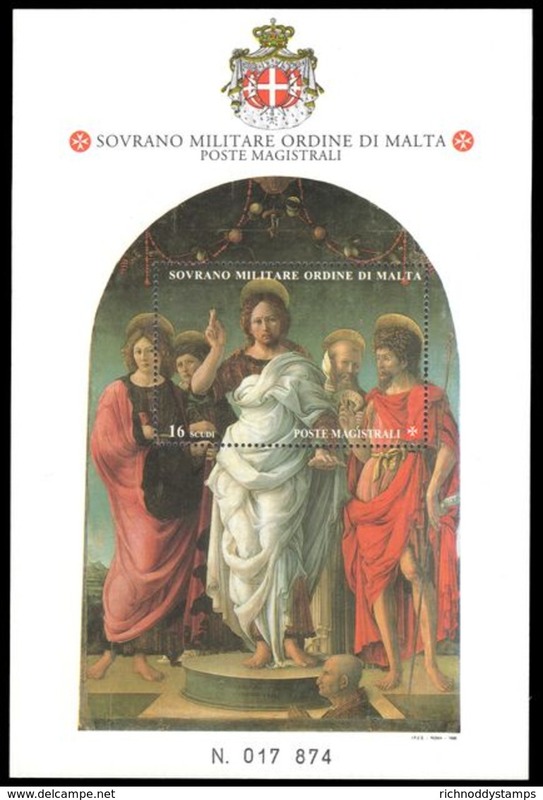 Sovereign Military Order of Malta 1991 St John the Baptist by Viti souvenir sheet unmounted mint. Sovereign Military Order of Malta 1991 St John the Baptist by Viti unmounted mint. 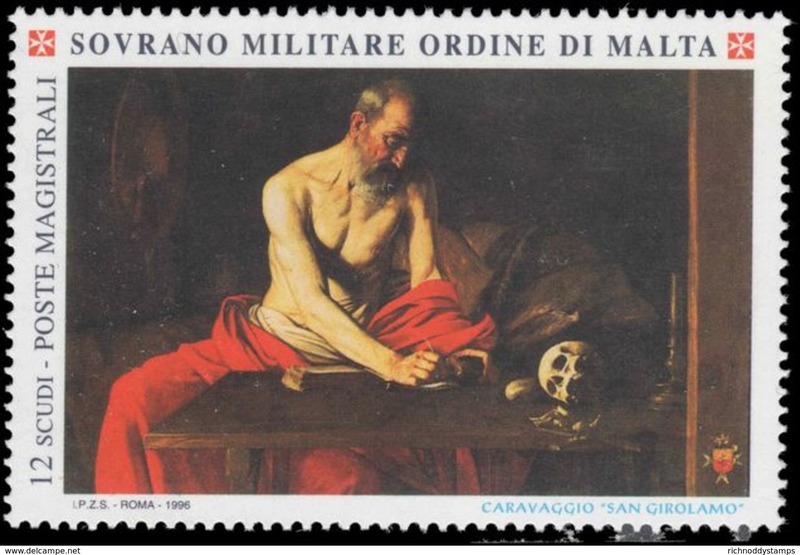 Sovereign Military Order of Malta 1991 Masters of Painting Caravaggio unmounted mint. 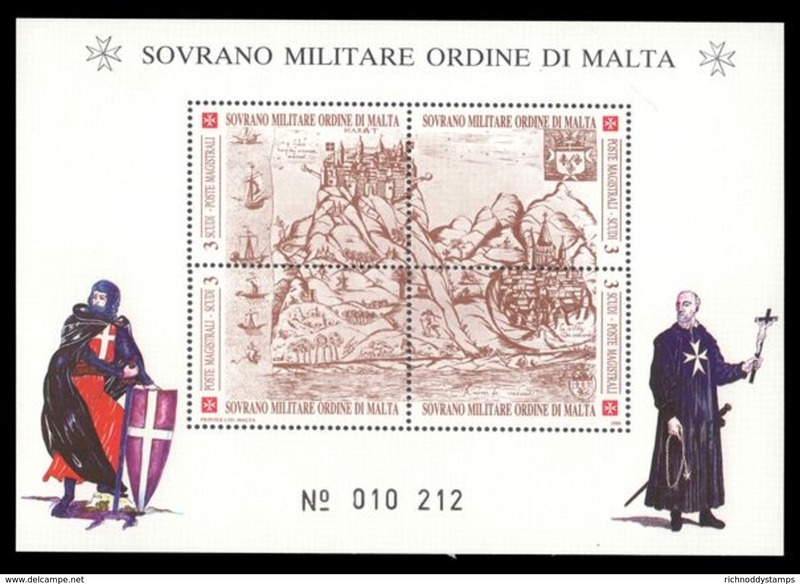 Sovereign Military Order of Malta 1991 Forts and Castles of The Order souvenir sheet unmounted mint. Sovereign Military Order of Malta 1991 Residences of The Order unmounted mint. Sovereign Military Order of Malta 1990 Solemnity of The Order unmounted mint. 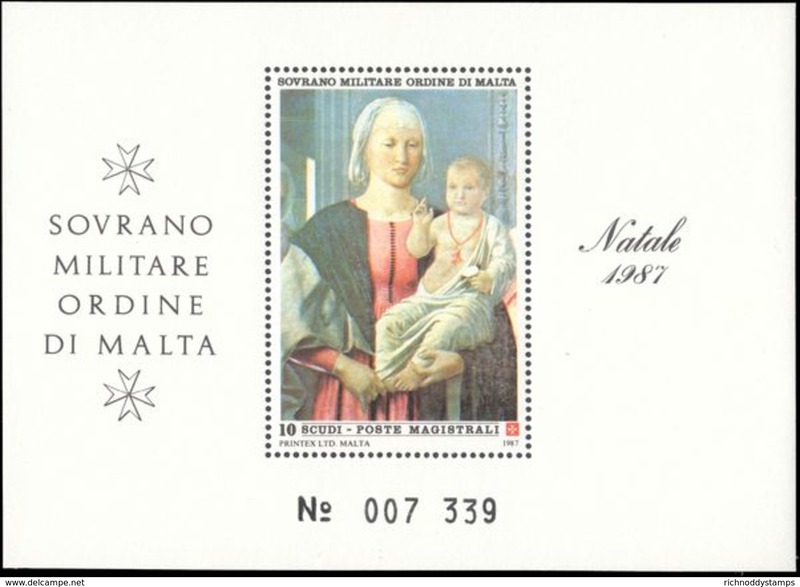 Sovereign Military Order of Malta 1990 Madonna by Bellini souvenir sheet unmounted mint. Sovereign Military Order of Malta 1990 Madonna by Bellini unmounted mint. Sovereign Military Order of Malta 1990 Postal Convention with Paraguay unmounted mint. Sovereign Military Order of Malta 1990 Refugees unmounted mint. 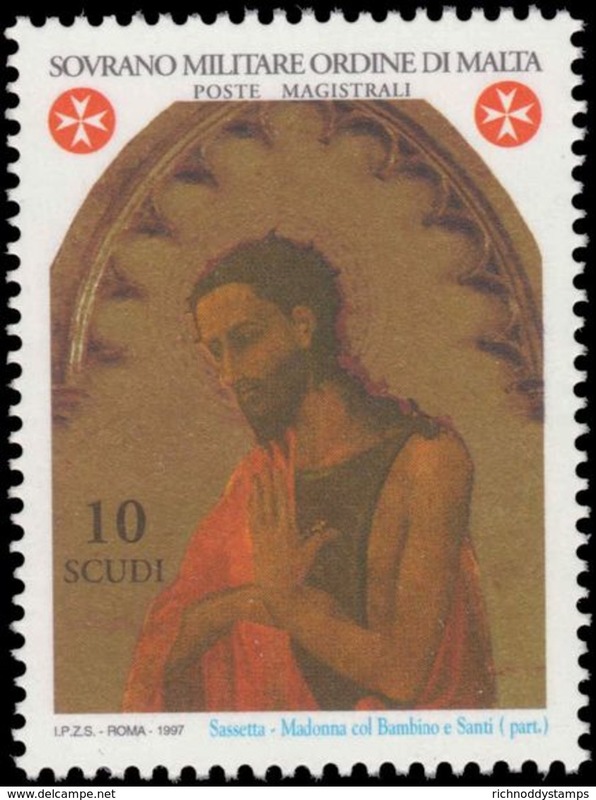 Sovereign Military Order of Malta 1990 St John the Baptist Misericordia of Piero della Franscisco unmounted mint. Sovereign Military Order of Malta 1990 Masters of painting. 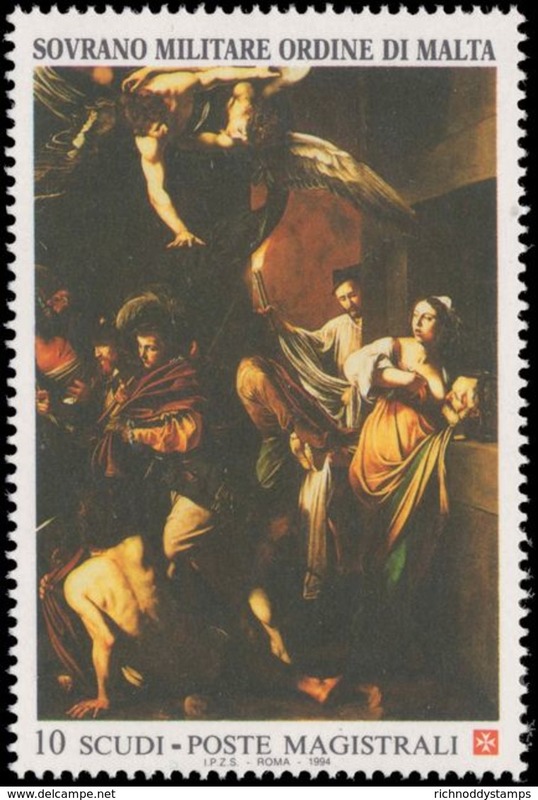 Caravaggio unmounted mint. Sovereign Military Order of Malta 1990 Ancient Uniforms of the Order fresco by Giacomo Cordelli unmounted mint. 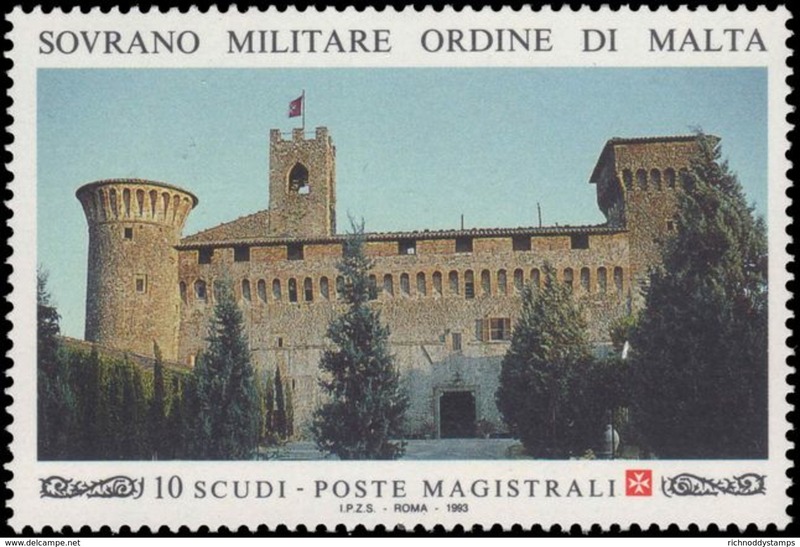 Sovereign Military Order of Malta 1990 Forts and Castles of The Order souvenir sheet unmounted mint. Sovereign Military Order of Malta 1989 Christmas. 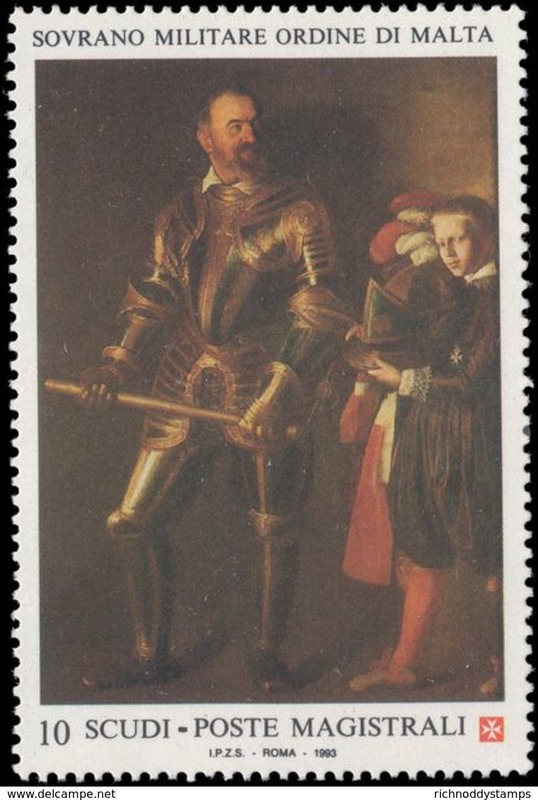 Picture donated by the Knights in 1525 souvenir sheet unmounted mint. Sovereign Military Order of Malta 1989 St John The Baptist by van Eyek souvenir sheet unmounted mint. Sovereign Military Order of Malta 1989 Coins unmounted mint. Sovereign Military Order of Malta 1989 Death of Pierre Andre unmounted mint. 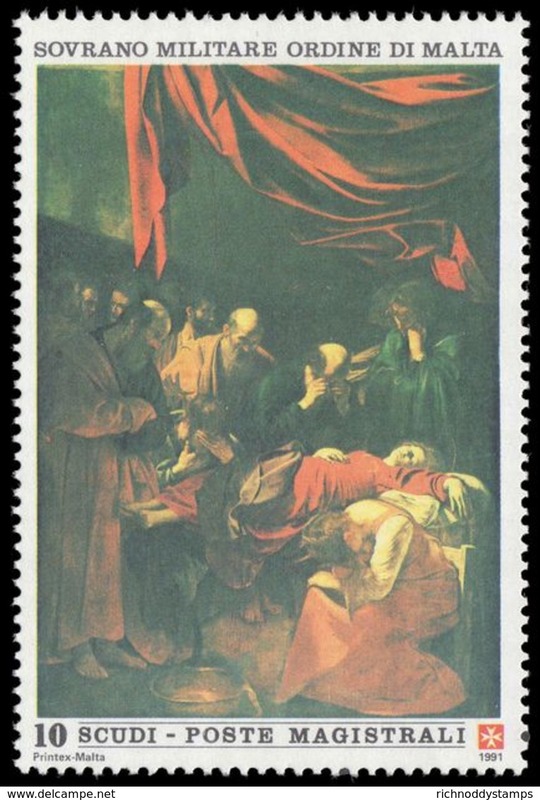 Sovereign Military Order of Malta 1988 Painting of St Rosalind by Preti souvenir sheet unmounted mint. 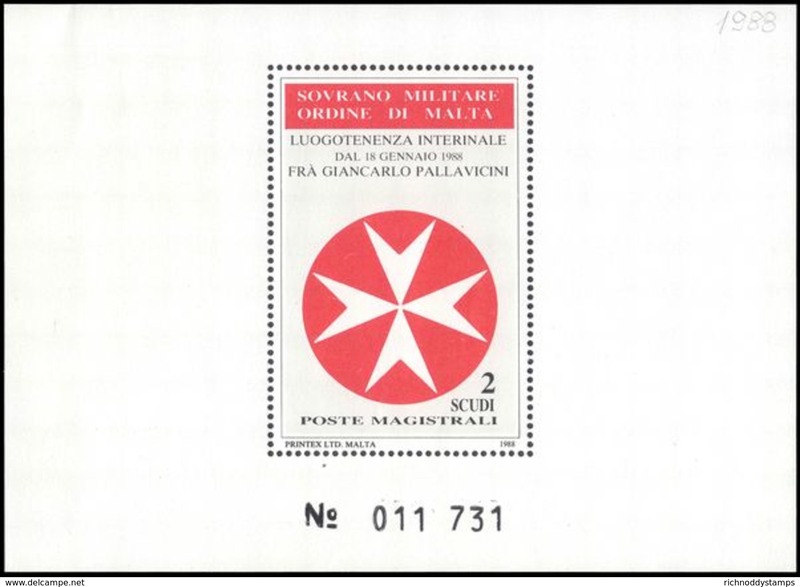 Sovereign Military Order of Malta 1988 Postal Conventions 1986-88 sheetlet unmounted mint. 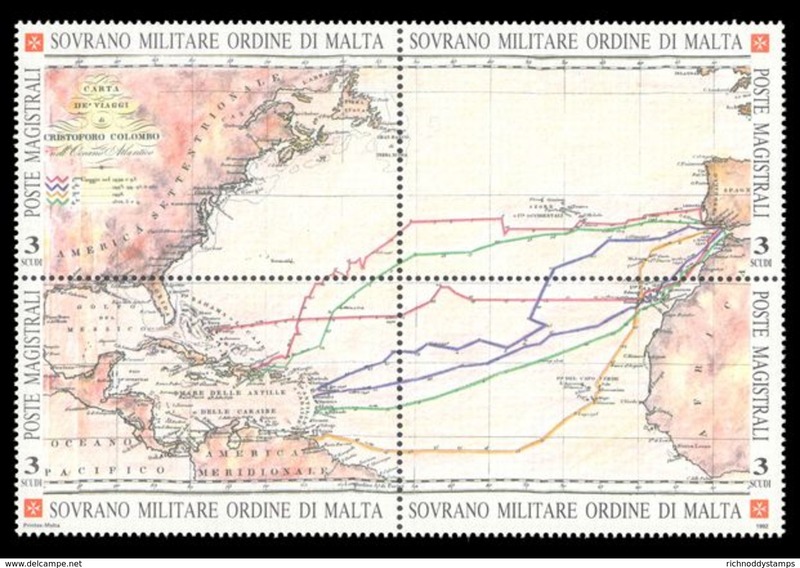 Sovereign Military Order of Malta 1988 Postal Convention with Comoro Islands unmounted mint. Sovereign Military Order of Malta 1988 Postal Convention with Congo unmounted mint. Sovereign Military Order of Malta 1988 Postal Convention with Zaire unmounted mint. Sovereign Military Order of Malta 1988 Election of Father Andrew Bertie as Grand Master unmounted mint. 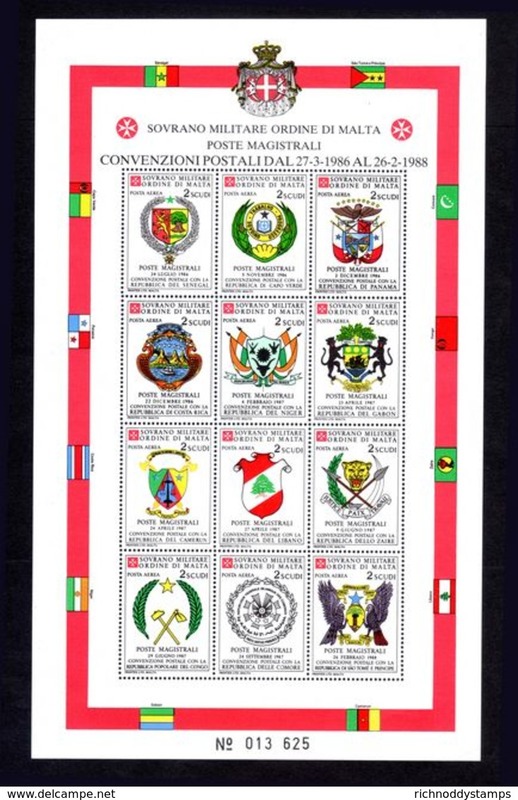 Sovereign Military Order of Malta 1988 Eight pointed cross of the Order souvenir sheet unmounted mint. 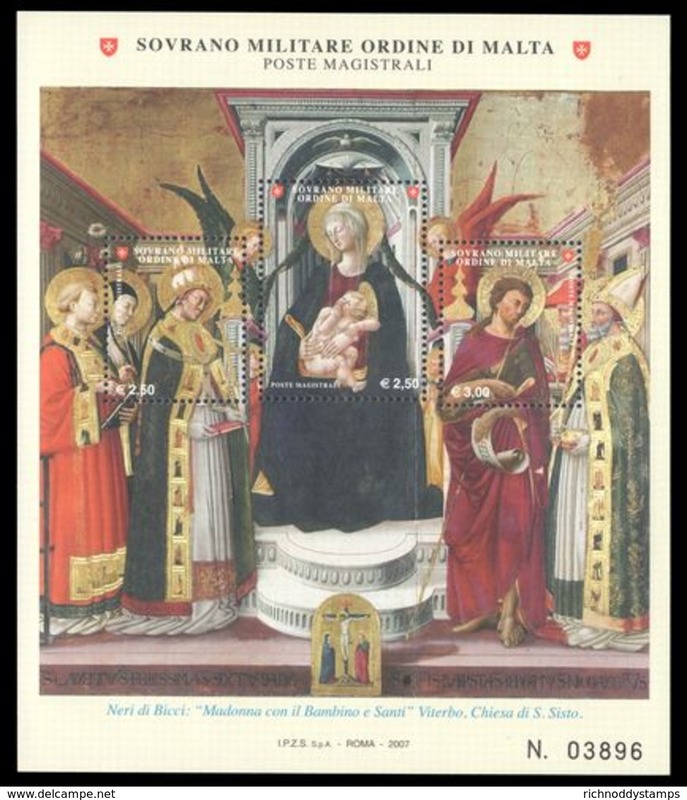 Sovereign Military Order of Malta 1987 Madonna by Piero della Francesca souvenir sheet unmounted mint. Sovereign Military Order of Malta 1987 Madonna by Piero della Francesca unmounted mint. Sovereign Military Order of Malta 1987 Postal Convention with Cameroon unmounted mint. Sovereign Military Order of Malta 1987 Postal Convention with Gabon unmounted mint. 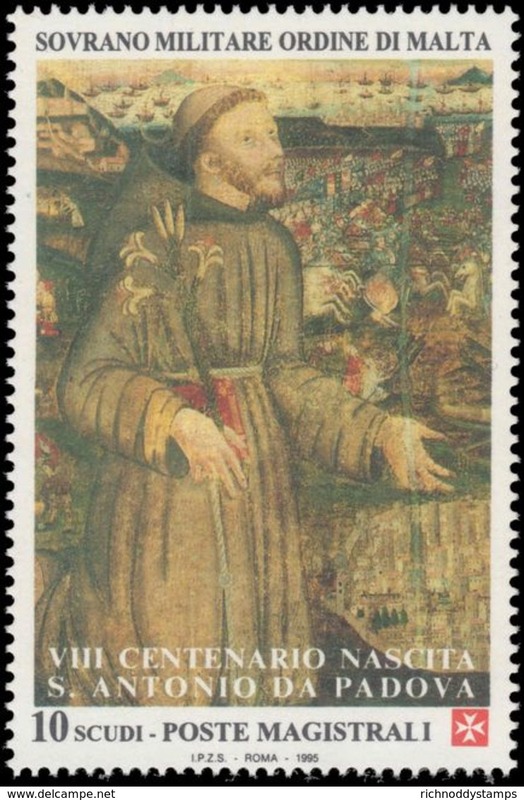 Sovereign Military Order of Malta 1987 Historical-Artistic Relics Fresco of Gerolamo of Treviso unmounted mint. 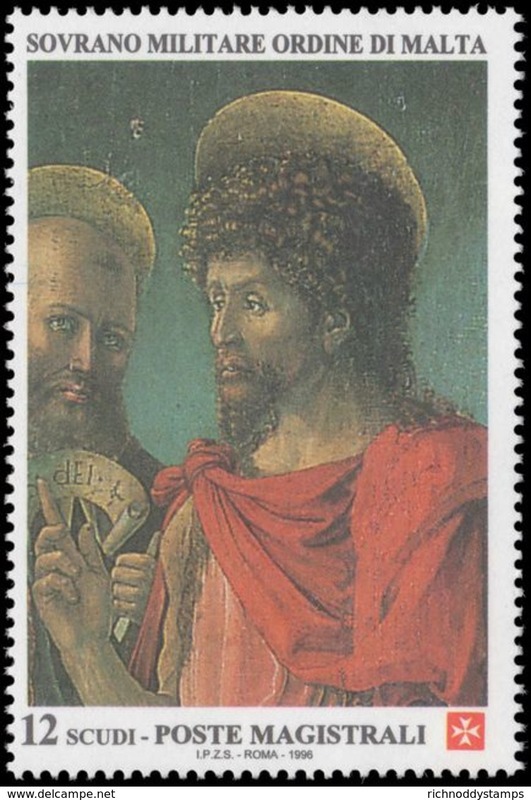 Sovereign Military Order of Malta 1987 St John the Baptist by Botticelli unmounted mint.